The XT Table Top timer with 2 or 4, fifteen-amp AC outlets. The XT Table Top timer with 2 or 4, twenty-amp SPST relays (277V max). Designed for permanent installations, primarily in commercial and industrial settings. Field expandable up to 16 independent circuits using plug-in "EX" modules. Electronically identical to the XT Wall Mount, but designed to fit a standard 19-inch instrumentation rack. Ideal for outdoor lighting and energy management applications, with a super user-friendly interface. Total Systems integration, and multi-site remote management system. 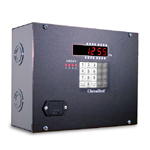 Flagship L-Series timer, expandable up to 16 circuits with "EM" or "EMB" relay modules. 7-Day Timer with 2 or 4 AC outlets or Terminal strip. Wall mountable 7-day timer. 2 or 4 independent circuits.